The original website didn’t even know what “mobile friendly” was. You would spend most of your time trying to zoom in and move the text from side to side in order to read the site. The new site simply adapts to the size of the screen and images are optimized for mobile download. We were able to completely overhaul the entire website, integrate social media (both Twitter & Facebook), and increase the usability of the site as well. We also visited each location and took detailed photos (both inside and out) of the location. That is yet another thing the previous website completely lacked. The original website missed every opportunity to let the major search engines know that there were 5 different laundromat locations associated with this single company name. You’ll notice that the main page had 5 different maps showing each Laundromania location. 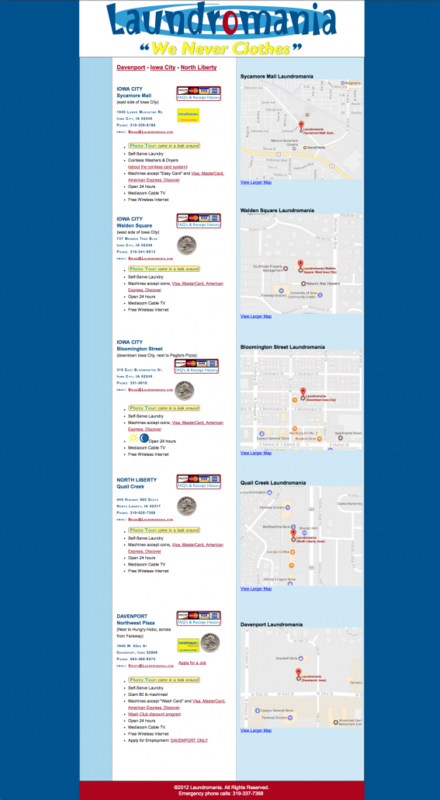 Now the website has a page dedicated to each location and the amenities that each location has. There’s also a breakdown of washing machines at each location along with detailed instructions on how to use them. Just about every opportunity to make these 5 laundromats found online were missed. We rectified that and now when most people search something as general as “Laundromat Iowa,” people are able to find “Laundromania” as the number one option. The original website was not a CMS (content management system). It was straight HTML. Each month the Davenport location hosts a “QC Laundry Love” event where people can wash their laundry for free. We made a blog post so the owner can post about this ongoing event without our help. So Laundromania is the top Laundromat in the state of Iowa on SERP (search engine results page). But how does that relate to the overall bottom line of the company as a whole? The accountant for Laundromania was delighted to see the increase across the board, from revenue to overall foot traffic into each Laundromania location. We weren’t able to just get number 1 for Laundromat in Iowa. We were able to get Laundromania ranking number 1-3 on Google Map results and number 1-4 for listed results in Google. Numbers 5-7 are directory listings and not actual Laundromats! We’ve crushed the competition with this website. Why does this really matter? The increase in the owner’s bottom line with increased sales has paid off. He has spent well over $5,000 on this website, social media marketing and pay per click ads on Facebook. But the increase in sales pales in comparison to his investment online.